Ulysses G. Longcannon loves his country and would go to any lengths to protect his native soil from harm or invasion. A veteran of two wars, a decorated soldier, and a brilliant tactician, Ulysses Longcannon rose up the ranks quickly and earned much trust and respect among his peers. However, his experiences in wars soured his disposition towards his fellow man and he grew increasingly ruthless and overzealous in his patriotism. After being approved to form his own team of elite soldiers, Longcannon formed the Foxy Commandos, intent on stopping terrorists and enemy forces before they could even strike – even if it meant working outside of approved channels or international laws and ethics. For the most part, this hand-picked team performed admirably, but the increasingly-deranged commander grew more and more paranoid that his soldiers might falter in their duties or let such petty things as compassion or emotion compromise their missions. Partnering up with several unethical but government sanctioned scientists, including Doctor Digitalus, Longcannon began systematically and thoroughly brainwashing his soldiers into ruthless drones capable only of carrying out their orders flawlessly. When some soldiers resisted or tried to escape, Longcannon ensured their cooperation and compliant by force. With such power over so many women in peak physical condition, Longcannon soon began to enjoy their other services and abilities as well, entirely off-the-record. One soldier, however, seemed to go AWOL – Commando Georgia Brown – and disappeared off the grid. This breach of security troubled Longcannon, but the talented espionage agent was successful in covering her tracks. 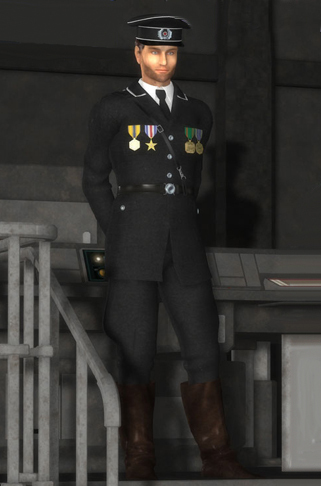 Years later, he promoted Commando Amelia Applegate to be the test pilot for the new Afterburn military flight suit, a mission that just so happened to stumble upon Georgia Brown, now settled in Metrobay. When informed his missing soldier had been found, the General began scheming of ways to reacquire his missing pawn. So long as Georgia remained loose, he reasoned, the nation’s security was at risk. She knew too much and could expose the truth of their illegal activities, and the world couldn’t handle the truth.